This picture doesn’t look a whole lot different from the one I posted earlier in the month, but individual plants are doing better. I know it will look a lot fuller by this time next month. 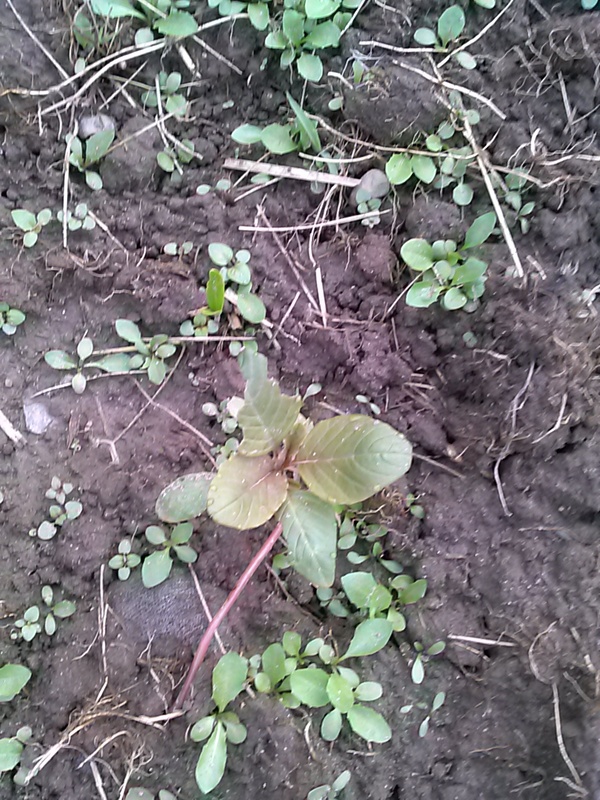 Here is one of my Amaranth plants. I grew them as seedlings, hoping to do a larger area of them, but I ran out of room. This is the first year I’ve grown it so I want to try it out and see if we even like it before dedicating more garden space to it. 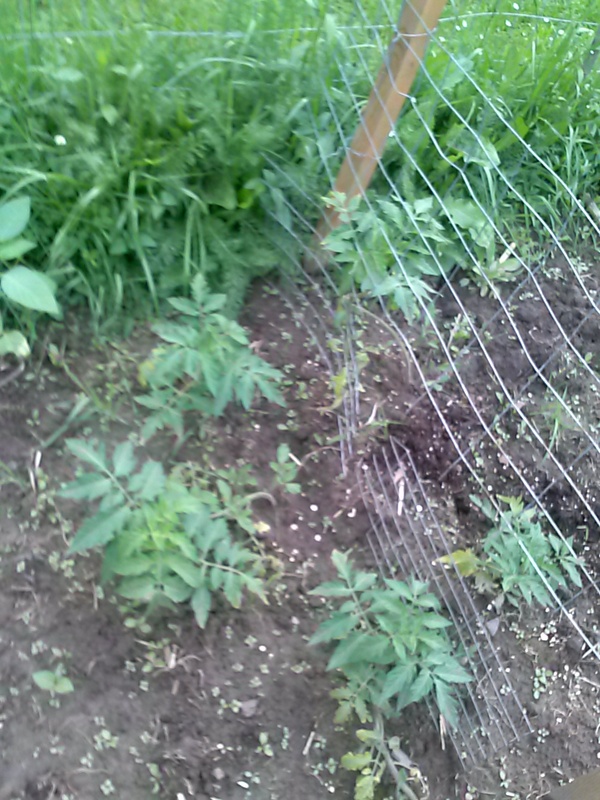 My tomatoes are doing better than they were when I first transplanted them. I’m going to give them a bit more time before attaching them to their trellis. Here are some sunflowers. I put some seedlings in, and they didn’t seem to be doing so well, so I planted seeds directly in. They are all growing fine, so I will have quite a few. I think I have 10, and they are a mix, some giant; some yellows and oranges that get tall with smaller flowers. This was supposed to be all corn – white corn on the left, and yellow on the right. I have one or two white corn that sprouted. The yellow corn is doing pretty well. 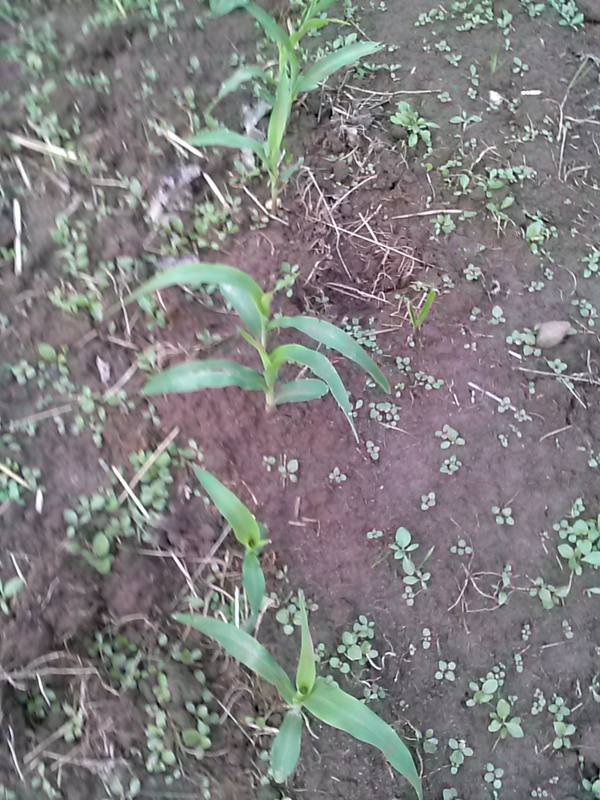 I just planted some more yellow corn seeds in where the white corn was supposed to grow. I have flowers growing along the pathway. 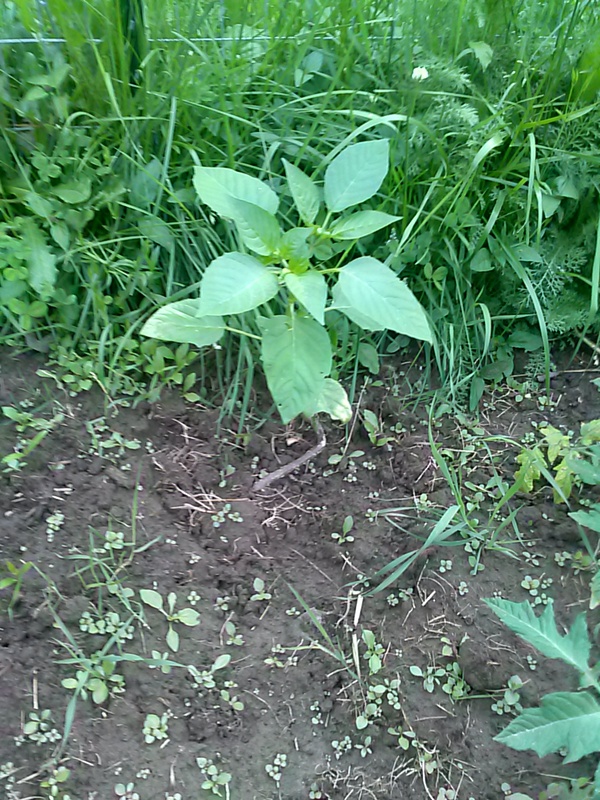 Some black eyed susans, evening primrose, and others. 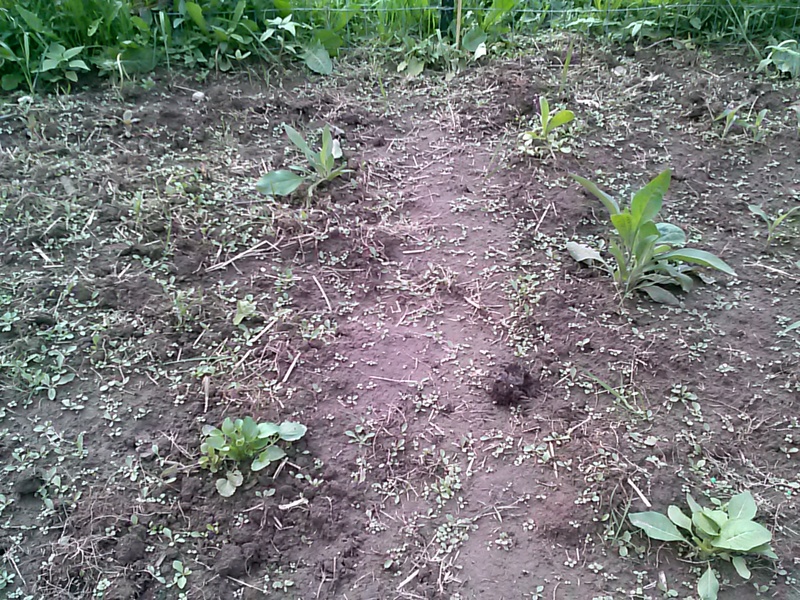 As you can see, I have a big job of weeding ahead of me – I am waiting till the weeds are bigger and easier to pick. Here are my little yellow corn plants. 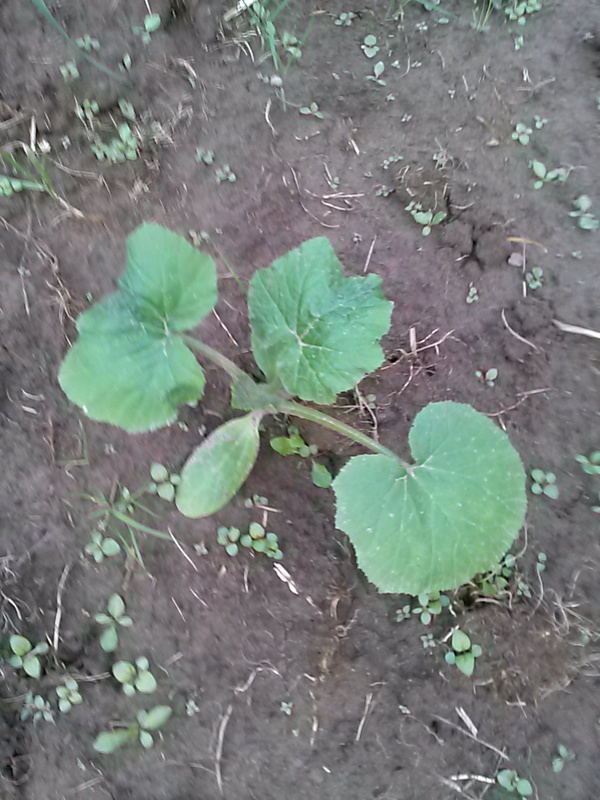 A squash plant. I’m not sure what I have where anymore with the squash. 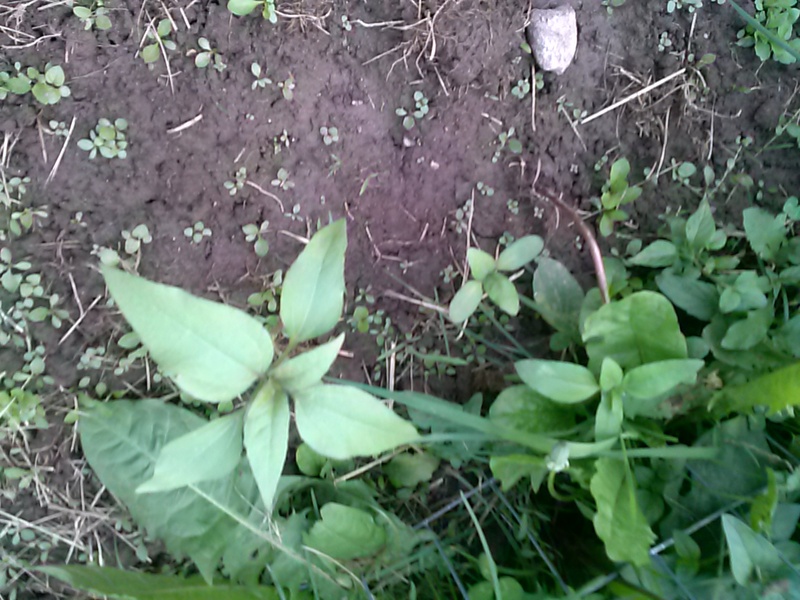 I replanted seeds, and leftover seedlings, where original seedlings had died. I think this is a yellow squash. 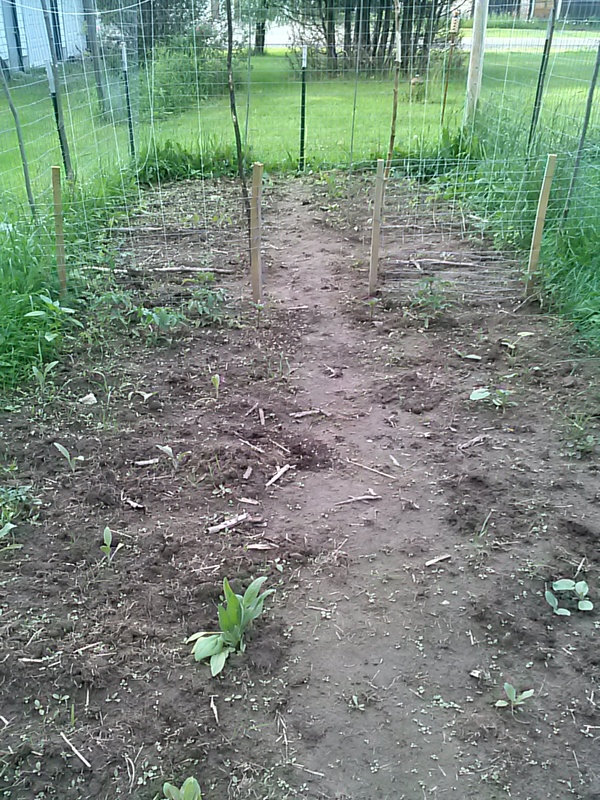 I should end up with a few zucchini, yellow squash, and acorn and butternut squash plants, I think. I will find out when they grow. 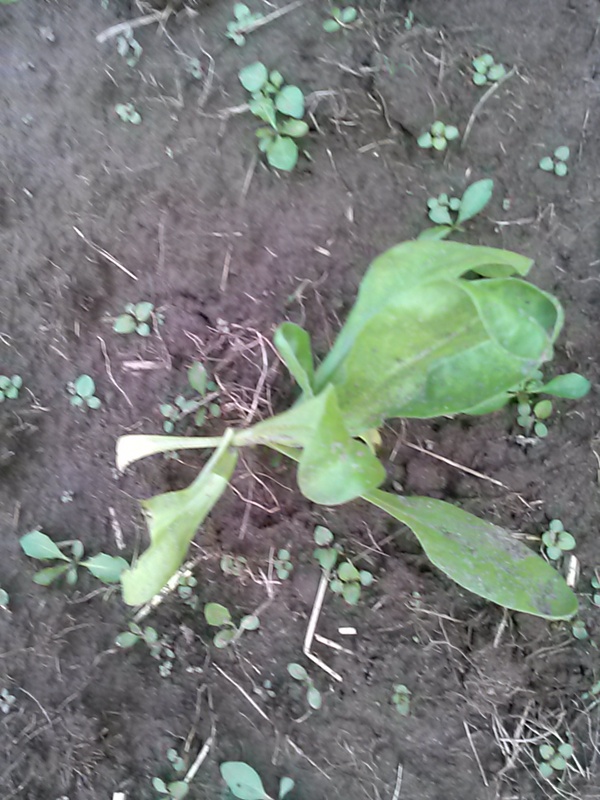 A calendula flower plant. I’m excited, this is the first time I’ve grown them. They are supposed to be pretty, and also medicinal/edible. Some of my peas. They are just now starting to climb their strings. A big tomatillo. This is one of the original-started seedlings. It is the only one that survived that planting. I planted the smaller one, in the picture above this, later. Unfortunately this one is getting flowers, and they need to cross pollinate to get any fruit. We’ll see if I get any this year. My other plant is very small compared to this one. One of my artichokes. 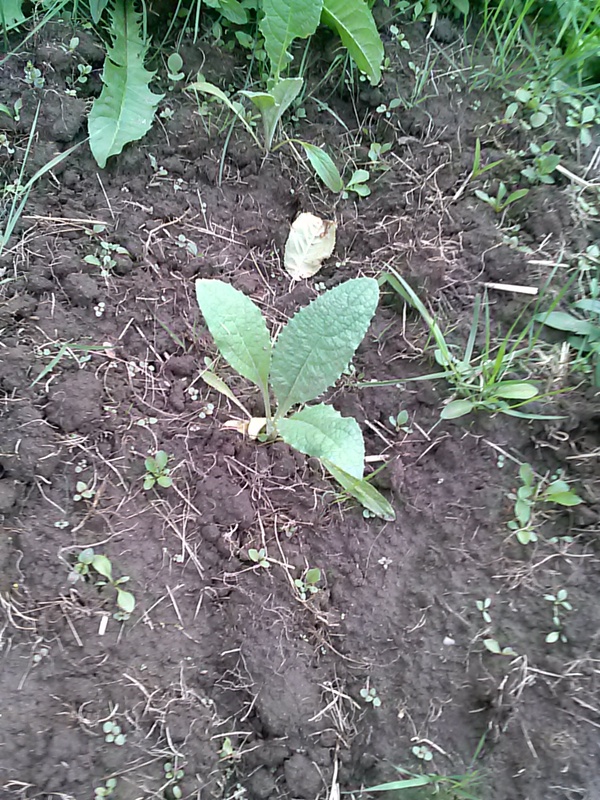 I love artichokes and heard they will grow as an annual here. 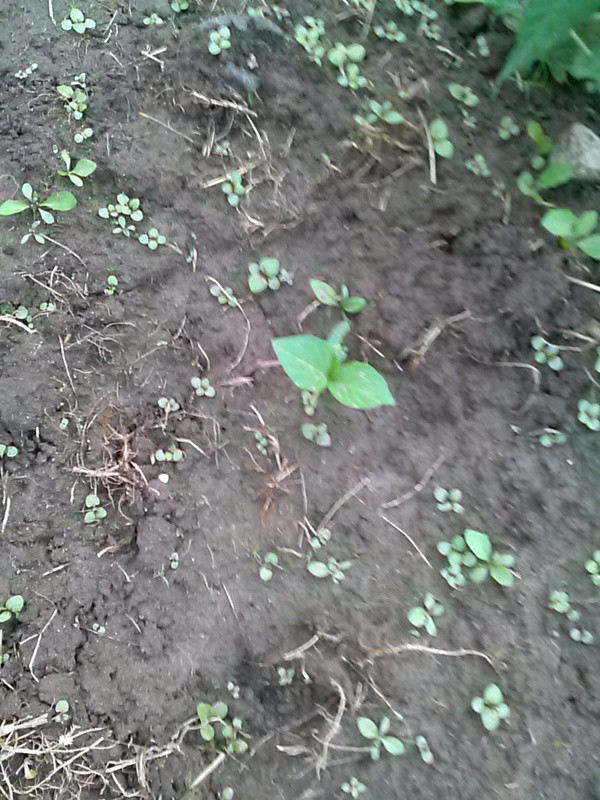 So far my 9 seedlings that I put into the garden are all doing great. 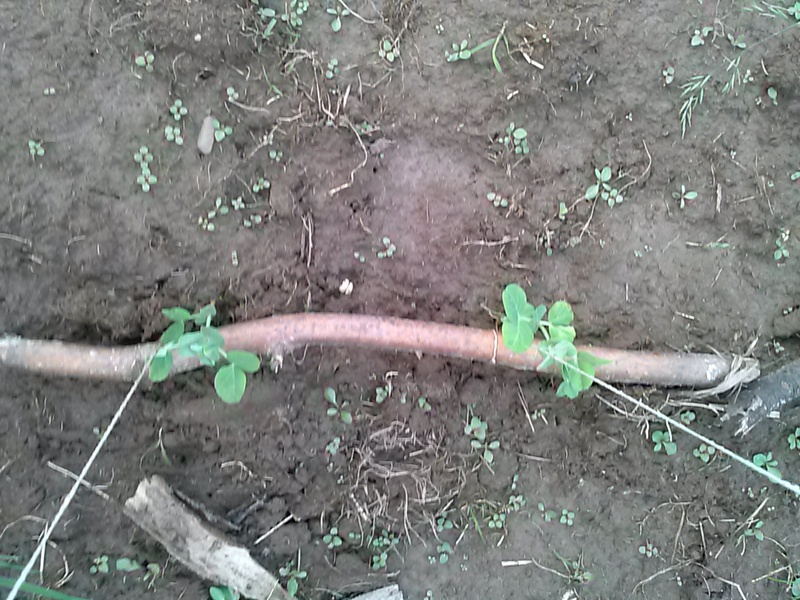 It might be easier to get those little weeds now using a hoe rather than picking out when bigger. They, and your garden, will fill in quickly with a little more sun I think!